Leavening, the lighthearted companion, completes the trilogy. Happy reading! With Robin’s Rules of Order, I knew what I was going to write before I started writing. The ending was there from the beginning. I did have to fiddle with the details a bit, but only a bit. Writings on Robin’s Rules has been a whole different beast, but still a companionable one. Rather than declare a book in the works, I declared (only to myself) that when inspiration struck, I’d write an essay exploring a rule or principle. And I was pretty darned inspired. Some of the essays tumbled onto the page as fast I could type; others needed more cajoling. I only wrote when there was something that caught my attention, but as the year went on, I found that more things, not fewer, were attention-getters. Things I’d previously ignored became impossible to ignore. I’d become a keener observer of people (myself included) and things. When you really look, there’s a lot to see. And the connections to my principles and practices, were at times, eye-popping. Biting off chewable and digestible pieces, Writings has been pretty delicious. I hope you’ll enjoy it too. Read from start to finish, or pick and choose. The order isn’t important. All that really matters is that you find a few satisfying morsels that make you think, then do. A work in progress for years, these Rules were birthed February 15, 2008 in written form, but they’ve been my companions for as long as I can remember. My work as a professional organizer prompted me to codify them. (Codify sounds overly lofty- like something Hammurabi or Moses would do, so let’s just say I wrote them down.) It was through helping chronically disorganized people, overwhelmed by their possessions, that I came to understand that the boxes, bins, trash bags and labelers were tools to employ after getting a grip on the psychological and emotional components of stuff. The play on Robert’s Rules of Order is both obvious and intentional. Robert’s Rules provided clear, authoritative guide to parliamentary procedure. 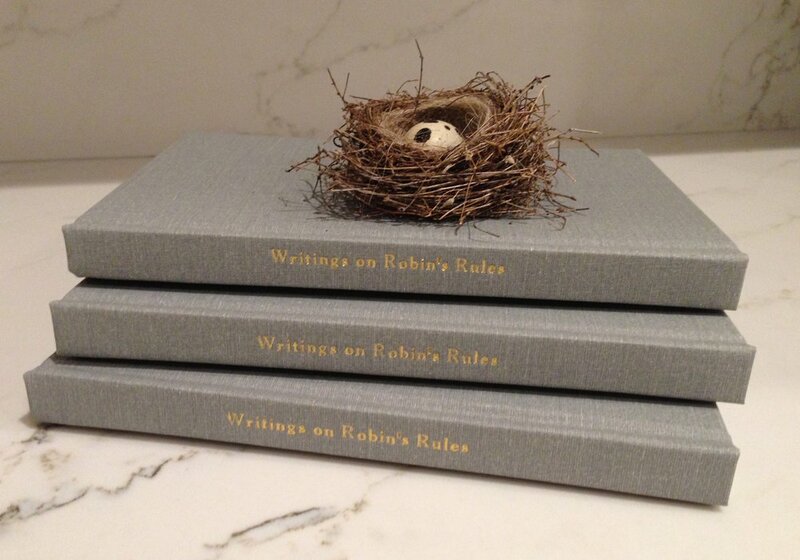 I hope that Robin’s Rules might provide an equally clear and reliable way of dealing with your possessions. These rules are the practical incarnation of the philosophy or principles which underpin them. Pondering the purpose and place of stuff is nothing new, but in our hyper-consumer culture, we seem to have lost our way. Continuing to go off trail is a perilous journey. The Rules are one way of getting back on track. I am not trained as psychologist or counselor. I am no longer a professional organizer. I am just one of those people who has always known that less made me happier, not sadder; that I couldn’t have the best of everything, so I’d better decide what was worth sticking my neck out for; and that curating my things like they mattered (which they do), made me a master, not a servant. So whether your tastes run toward chiffon or cashmere, shag or Persian, Ikea or antiques, the Rules of Order still work. If they help you to be more focused, thoughtful and intentional about your material world… hooray! Message sent matches message received!